The best solar cooker for you is the one that fits your cooking needs, your location and your budget. There are a number of commercial options available, or you can make your own. 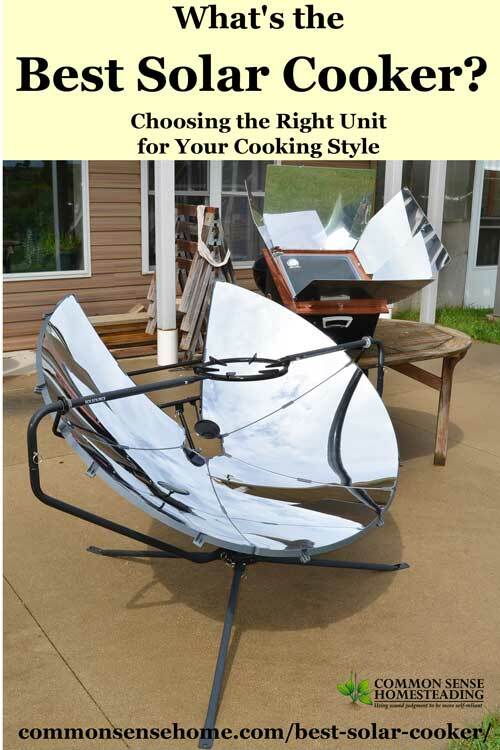 (See Getting Started with Solar Cooking for DIY solar cooker ideas.) This post covers my top three “off the shelf” solar cookers to date – one for “stove top” style cooking, one for slow cooking and one that provides higher temp baking – the SolSource, the Sun Oven and the GoSun Sport. The SolSource is a parabolic solar cooker, concentrating a large amount of sunlight onto a small cooking surface. You use a SolSource unit in the same way you use a stove top burner or grill, i.e. for grilling, boiling, frying and sauteing. Baking and roasting is trickier, but can also be done. This cooker gets hot – temperatures over 450°F are possible. We found that when using it with a Dutch oven, straight on midday summer sun created a hot spot on the bottom of the pot that wanted to scorch the food. (I think a wok might work a little better because of its rounded bottom, but I don't have one at this time.) Temperature extremes can be moderated by moving the pan or moving the cooker a little away from direct sun focus. Good news – this means you can still cook when there's not heavy duty full sun. The unit consists of an adjustable metal frame and a lightweight reflective concentrator. We keep the frame outside under our deck, and hang the concentrator inside to avoid having it dull over time with weather exposure. (SolSource also sells a fitted cover if you need to store it outside, or you could use a tarp.) The unit is fairly large, but it lightweight and easy to move. Invented here in Wisconsin and now settled in Illinois under the direction of Paul Munsen, Sun Ovens have made an impact around the world. I was introduced to the Sun Oven many years ago when I first got started in the solar industry. For 28 years, they've been making their solar box cookers here in the USA, and many of those original units are still in service. Best for slow cooking, baking and dehydrating, the Sun Oven works best for cooking that requires low, steady heat. It can also be used for boiling or sterilizing water (Sun Oven sells indicators that you can use to check if your water has reached a safe temp), and rehydrating freeze dried emergency foods. They also offer a Cloudy Day Cube Stove and Fuel Disks so that you can use your oven even when the sun isn't shining. Here in northeast Wisconsin, I've found that I really need full sun to get best results for baking, but slow cooking and dehydrating are more forgiving. If you like using a slow cooker, odds are you'll love using a Sun Oven. 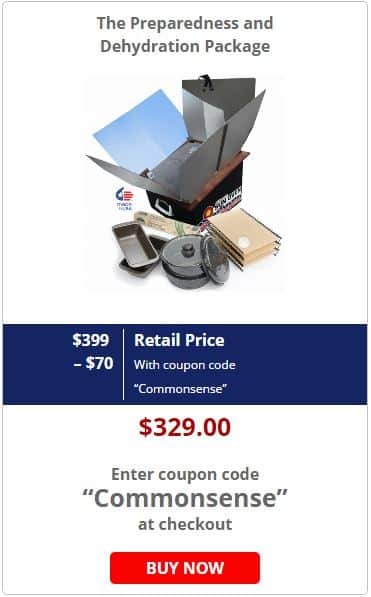 Click here to get $70 off your Sun Oven purchase. Like the Sun Oven, GoSun Sport is designed for portability. At only 7 pounds, it's the lightest of the three units. It holds up to 3 lbs (1.4kg) of food – think small bag of potatoes or good sized roast equivalent. At 24″ long, it can easily be used on a table top. How it works – The GoSun features compound parabolic reflectors combined with a borosilicate vacuum tube oven. The reflectors focus the sun in on your food, the vacuum tube oven traps the heat. It's like a glass thermos. How hot does it get? The website claims it can reach 700°F – more than hot enough to cook just about anything. The vacuum tube helps hold the heat, even after the sun goes down. What can it cook? Just about anything you can fit in the tube – but don't put cold water in a hot oven! I first saw this unit on Top Chef, and one of the contestants made the mistake of pouring cold liquid into her pre-heated oven. The vacuum tube exploded, showering glass everywhere. Use your common sense. You don't put cold canning jars in a boiling canner, or take a pyrex dish from the refrigerator and put it straight in the oven. Cold liquid plus hot glass = bad idea. Customers on the GoSun website mention cooking eggs, sausage, potatoes, cake, veggies, meatloaf, bread and more. “Boiled” eggs don't work so well. The oven tends to get too hot. You can also make your own solar oven, but I personally appreciate the durability and extended temperature ranges of the commercial units. Homemade units tend to cook at lower temps and be more awkward to move and store. 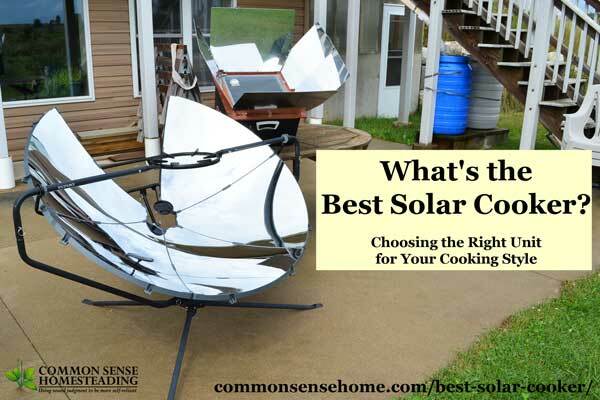 Which Solar Cooking Option is Best? It really depends where you are and what you want to cook. Want to set it and forget it before you leave for the day and come home to a hot meal? The Sun Oven is probably your best choice. Need to cook or bake in a hurry? The GoSun Sport is probably the fastest option. Do a lot of cooking early and late in the day and want to be able to fry some bacon and eggs and cook up pasta? Go with the SolSource. Do you have experience with solar cooking? Leave a comment sharing your preferred cooker, and any tips you have for those just getting started. This is my first summer experimenting, so I know I have a lot to learn from more seasoned solar cooks. Try cooking potatoes, in a pressure cooker – cook soooo much quicker and the flavour is supreme…! We’ve been playing with the idea of a sun oven, but we regularly get high winds here, usually from the south. So we haven’t figured out how to protect an oven from the winds, while still having access to the sun. Great article! Thank you. The sun oven comes with pins that can be used to tack it down and stabilize it. We get pretty serious winds here, too, and so far I haven’t tipped it. Glad you liked the article. Hi Guys! As an FYI, I have baked cornbread in my SolSource and it came out great! I just used my dutch oven as an “oven,” put a small rack in to keep the pan off the bottom, covered it and baked. It was done in approximately the same amount of time as compared to a conventional oven and what the directions indicated. Haven’t tried a cake yet but was very happy with the cornbread. B:) P.S. And I have deep fried donuts using my SolSource and a wok. lol – I’d love to see video of the doughnut frying!